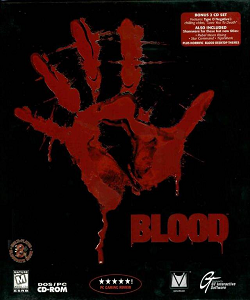 In this review, we resurrect the FPS game Blood to find out how this game plays. Note: This review only covers the original release and does not cover expanded versions. This game was released in 1997 and used the build engine – the same engine that was used to make Duke Nukem 3D and Shadow Warrior. You play the character Caleb as he seeks revenge on the Dark God. The game features four episodes: The Way of All Flesh, Even Death May Die, Farewell to Arms, and Dead Reckoning. In the first episode, you find yourself crawling out of your grave saying “I live again!” as you venture forth into the various levels before you. You have a pitchfork as your last emergency weapon. You can never lose this weapon, but if you can help it, you wouldn’t want to fight the many monsters with this. You can obtain TNT and a flare gun. The TNT, or essentially, bundles of dynamite, can be lit and thrown at an enemy or object. It explodes on contact with anything, so care needs to be given less you accidentally have it catch on a nearby chain and blow yourself up. You can hold down on the fire button so you can throw the dynamite further, but holding onto it too long can cause it to just blow up in your hands. The flare gun is interesting in that it’s like a pistol, but fires flares that stick in your opponents. That means, for weaker opponents like the brown hooded enemy, they’ll light on fire and die in one shot. Good for saving ammo – especially when you go up against zombies who also die in one shot as opposed to multiple shots from some other weapons. Other weapon you can encounter include the shotgun (which is surprisingly weak even though you have two shots per blast), Tommy gun (your machine gun), napalm gun (which is basically a rocket launcher), and even aerosol spray (which, when combined with your lighter, becomes a makeshift flamethrower). Different weapons have their strengths and weaknesses. The great part about this game is that you’ll always find new weapons as you progress through to the next episode. Episode 4 has weapons you can’t seem to get in any other episode for instance. Also along the way are the various enemies. There are the brown robed enemies that fire shotguns. The blue robed enemies fire Tommy Guns at you. Zombies wield axes, but just because they go down doesn’t mean they are dead. More often then not, a shotgun blast will merely knock them down. It isn’t until they get up are you able to deliver that second fatal shotgun blast. Another enemy is those flying reaper enemies. It took me a bit to figure out that you have to wait until they are no longer transparent that you can actually hit them (which effectively means either when they are about to fire at you or are flying right up to you and about to take a swing at you with their sickles). Perhaps the most annoying enemy, though, are the disembodied hands. While information about them suggests that you can throw them off after they latch on to you by hitting the action command, I’ve only ever successfully done this once. If you’re like me and can’t seem to get them off of you, once they latch on to you, it’s only a matter of time before they choke you to death. Their small not only makes them hard to hit, but also hard to find sometimes. An interesting feature that was added was the use of innocents. These are people that run around and are harmless to you. Unlike Duke Nukem 3D and Shadow Warrior, innocents actually move around on the level randomly. There are also stationary characters, but I only found them on one level (the mimes). There doesn’t appear to be any penalties for killing innocents with the exception of, perhaps, being unable to jump on them and make it over a ledge that contains a secret. This, however, is rare. Also along the way are various items. Probably one of the most useful items are the life essence. This appears as a 2D heart that, when collected, adds 20 to your health for a maximum of 100. Most often, they are randomly dropped by enemies. I’m not sure of the odds, but sometimes you can get a batch of them after defeating a room full of enemies while other times, you can hike a good distance and only find 1 after defeating numerous enemies. A great item that you can pick up is the life seed that appears to be a blinking eye. This will give you an additional 100 health points for a maximum of 200 health points total. Additionally, there are the various forms of armor you can find. Armor is split in three ways. The red armor is the fire armor. This reduces any kind of fire damage you take. Second armor is the personal body armor (blue). This armor helps reduce general damage including weapons fire and, if you’re lucky, blast damage. The final kind of armor is the spirit armor (green). This armor protects against spiritual attacks. While you won’t encounter these kinds of attacks that often, you may be grateful if you do get hit and you have that kind of armor with you. These pieces of armor can be picked up individually and are worth 100 armor points each. Additionally, you can collect special kinds of armor which increases points in all three. This can be the basic armor which adds 50 points to all 3 or the full armor which maxes out all three traits to 200 points. Most critically, however, are the various keys that you need to pick up so you can unlock the numerous kinds of doors (or, in some cases, switches). This game takes a slightly different approach to keys. While games like Doom and Duke Nukem 3D have three different color coded keys (and shadow warrior has up to 8 kinds of keys divided between four colors and two types), this game scraps the color system altogether and uses a picture system instead. You can find many different keys including the spider key, skull key, moon key, eye key, fire key, and knife key to name a number of them. While it was great to see this level of creativity with this new key system, it would have been better to have this key system appear on the main HUD so you don’t forget whether or not you got a particular kind of key. Finally, there are items you can use at a later time. One was the doctors bag which can replenish your health up to 100 at any time. The bag only holds 100 health, so you need to use it wisely because it does have a habit of running out sooner than you would like. Another item is the jump boots. You can turn it on or off at any time. Not only can you jump higher with these boots on, but also survive larger falls in the process. Quite useful at times, really. While I did find Beast Vision, I never really figured out what it did exactly. I was expecting it to brighten dark rooms, but for some reason, that didn’t happen. The great thing is that this game uses the build engine. It’s great because if you’ve played Duke Nukem 3D or Shadow Warrior, you have an idea of what you can expect. The downside is that you also inherit some of the bugs found in this engine. While it is a known bug that you can die simply by closing or opening doors, this game seems to suffer from this bug the worst. I’m not entirely sure why, but I’ve never died so many times in a game from opening or closing doors. It is also possible to kill yourself by running into a a gradually narrowing opening. This, thankfully, only happened once when I was backing away from a gargoyle into a crevice. I killed the gargoyle, but the crevice got me. Strange. One bug I encountered which seemed unique to this game was that, during the Dire and Brimstone episode, the skull key simply never appeared. I got quite lost and couldn’t for the life of me, find the key. It wasn’t until I finally found a YouTube video that I realized that it was simply missing from the beginning. Even restarting the level never worked. It required a cheat code to get past the locked door. It was also the same level I discovered that, while you’ll get penalized for cheating after you finished the level, all you need to do is save the game right before the exit. When you load that level and exit the level, the game will respond as if you never cheated in the first place. So, the game will never know you cheated as long as you save right before exiting the level and reloading. At the end of each level, you’ll encounter a horned icon. Pressing it will allow you to exit the level. You get treated to deathly moans and screams as well as a really basic tally of how well you did: how many enemies killed out of how many on the map and how many secrets you found out of how many that were there. At the end of each episode is a boss fight. If you kill the final boss, you’ll get treated to a small cutscene. While the 3D animations are quite primitive, they are quite impressive for the time in terms of overall quality. Of the four episodes, my favorite was probably the first. It’s not that this is because it was the easiest, but rather, there was the most innovation in each level. You had things like riding on moving trains for an entire level, minigames in a carnival, automatically moving mine cart rides, and various traps. The second best episode was probably the last one for me. This isn’t because I knew I was finishing the game after this episode, but because there were still some interesting innovative features. It also didn’t seem quite as drawn out as episodes 2 and 3. The two middle episodes always felt like they were a map too large. There was not enough major differences to keep the whole thing interesting. They were still good, but they got a little tedious by the time you got to the last map or 2 before the boss. I thought the level design was quite well done. There was a good amount of variety between the different levels between the episodes. The levels might get a bit tedious within the episode, but each episode seemed to be refreshing and different. The most unique map I’ve seen, although probably the most disgusting, was the second to last level on the final episode where you seemed to go through various organs. Disgusting, but very well done right down to the moving platforms having very particular movements. A very good feature that seemed rather unique to this game (so far as build games were concerned), were the afflictions you can get. Green spiders can cause blindness while brown spiders can poison you. Fire breathing dogs can light you on fire as well. I don’t think I’ve seen camera tilting that much when my character was poisoned before, but it worked quite well for this game. Generally speaking, while this game did have some strange glitches (it even randomly crashed a few times on me which does stress the importance of frequently saving in this game) and it did drag a little to me, this was actually a pretty solid game. The level designs were interesting, there were some innovations in the level designs (though mostly concentrated on the first episode) that I could definitely appreciate. This game also takes a certain amount of time to play. You may spend an evening and go through an entire game sometimes, but in this game, you can spend an evening just trying to get through a single episode. For a casual gamer, this game may take anywhere between 3 – 5 days depending on how much free time you have. Not a game that takes weeks to play through, but also not a game that only has a few hours worth of gameplay either. Graphically, it was really nice to see a game of this period move away from mostly 2D sprites and try and utilize 3D objects. Unfortunately, no enemies are 3D, but most items (save for the life essence) are 3D objects. Some of them lie on the ground while others actually float and spin in the air). The textures are nicely varied as well. The various enemies that light on fire were also nicely done. The lighting had some interesting effects on the level. The various other effects like steam and water was also pretty well done. The enemy fire sometimes was also nicely done. The only thing was that games like Diddy Kong Racing and Quake II were also around at this time. The graphics of those games, in my opinion, were more impressive. So while the graphics in this game were good, there are other games floating around on the same year that were far more mind-blowing. The audio was interesting to rate in this game. On the one hand, the voice acting was impressive not only for its ability to capture a character with an interesting personality, but also in quantity where there were so many lines used in this game. There were numerous enemy sounds that worked very well as well. The ambiance heard in this game was also quite impressive. My only nitpick was that Caleb sounds exactly like some of the enemies when he is burning. Beyond that, I would say this game was very well done. On the other hand, the music was quite non-descript for the most part. The intro music was quite well done. This music was used in the first level in the first episode and the last level in the last episode. Beyond that, the music added little more than an interesting background sound that added a bit to the atmosphere. Beyond that, I felt that there was nothing to get excited about in terms of music. It was the sound effects that carried this game throughout. Overall, this game has a well realized spooky vibe to it. Each episode had great unique characteristics, though the levels within the episodes can be a been tedious at times – namely trudging through episodes 2 and 3. The item variety was good. The armor system was unique. The key system was innovative. The afflictions you can get are unique and interesting. The enemies had a great amount of variety. The graphics held their own pretty well. The sound effects were great. The music was a bit of a letdown once you get past the first track. Still, it was definitely a worthwhile game to play. Furthest point in game: Beat the game on Still Kicking. No, the game isn’t a pushover at that difficulty.